Water your yard with these unique sprinklers. 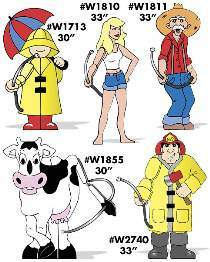 Water pressure from your garden hose makes arm or tail move back and forth to water a large area. A real traffic stopper. Plans drawn FULL SIZE. These sprinklers were designed to use our 1309 Lawn Sprinkler Hardware Parts Package. This kit contains the only hose we recommend for these projects. Mix or match 2 or more plans for discount. Lawn Sprinkler Hardware includes 28" of very flexible hose that allows the arm or tail of these sprinklers to move back and forth. It is the only hose we recommend for these projects. Package also includes hose connectors, end cap, screw eyes and mounting rods. Project plan, wood, epoxy adhesive and paint are not included.